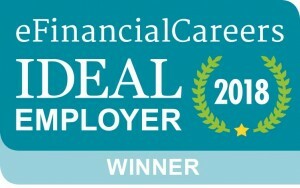 We’re proud to be ranked as the #1 Ideal Hedge Fund Employer after more than 6,000 finance professionals told eFinancialCareers about the employers they most want to work for and admire. On the heels of Citadel earning this distinction, our own Todd Barker, head of Surveyor Capital, sat down with eFinancialCareers to discuss what it takes to get a job, and thrive, at Citadel. Check out Todd’s full Q&A with eFinancialCareers to understand what differentiates Citadel from other hedge fund employers and how working on the buy-side compares with working on the sell-side. The full article is available at https://news.efinancialcareers.com/us-en/313962/jobs-at-citadel.